George Duke (January 12, 1946 – August 5, 2013) was an American musician, known as a keyboard pioneer, composer, singer and producer in both jazz and popular mainstream musical genres. He worked with numerous artists as arranger, music director, writer and co-writer, record producer and as a professor of music. He first made a name for himself with the album The Jean-Luc Ponty Experience with the George Duke Trio. He was known primarily for thirty-odd solo albums, of which 'A Brazilian Love Affair' from 1980 was his most popular, as well as for his collaborations with other musicians, particularly Frank Zappa. George Duke was born in San Rafael, California. He was raised in Marin City. It was at the young age of 4 that Duke first became interested in the piano. His mother took him to see Duke Ellington in concert and subsequently told him about this experience. "I don't remember it too well," says George, "but my mother told me I went crazy. I ran around saying 'Get me a piano, get me a piano!'" He began his formal piano studies at the age of 7, at his local Baptist church. It was those early years that influenced his musical approach and feel, as well as his understanding of how music elicits emotion. Duke attended Tamalpais High School in Mill Valley before earning a bachelor's degree in trombone and composition with a minor in contrabass, from the San Francisco Conservatory in 1967. Playing initially with friends from garages to local clubs, Duke quickly eased his way into session work, which refined his abilities and expanded his approach to music. He later earned his master's degree in composition from San Francisco State University. He also taught a course on Jazz And American Culture at Merritt College in Oakland. Beginning in 1967 Duke experimented further with jazz fusion, playing and recording with violinist Jean-Luc Ponty, as well as performing with the Don Ellis Orchestra, and Cannonball Adderley's band, while he acquainted himself with Frank Zappa. Duke appeared on a number of Frank Zappa's albums through the 1970s. Frank Zappa played guitar solos on Duke's 1974 album, Feel - the instrumental "Old Slippers", and "Love" - credited as Obdewl'l X, possibly due to contractual reasons. Duke covered two Zappa-composed songs on his 1975 album, The Aura Will Prevail, - "Uncle Remus" (co-written with Duke) and "Echidna's Arf" - that he had played on while a member of The Mothers on Zappa's albums. A further Zappa connection occurred on Duke's other album from 1975, I Love the Blues She Heard Me Cry - which utilized Ruth Underwood, Tom Fowler, and Bruce Fowler from Zappa's Overnite Sensation band that Duke was a part of, along with Zappa-associate Johnny "Guitar" Watson and jazz guitarist Lee Ritenour. Duke served as a record producer and composer on two instrumental tracks on Miles Davis albums: "Backyard Ritual" (from Tutu, 1986) and "Cobra" (from Amandla, 1989). He has also worked with a number of Brazilian musicians, including singer Milton Nascimento, percussionist Airto Moreira and singer Flora Purim. Lynn Davis and Sheila E appeared on Duke's late-1970s solo albums Don't Let Go and Master of the Game. Duke was prominent in the R&B genre, releasing funk-based songs like "Reach for It" and "Dukey Stick". In 1979 he traveled to Rio de Janeiro, where he recorded the album A Brazilian Love Affair, on which he employed singers Flora Purim and Milton Nascimento and percussionist Airto Moreira. The album contained music in a wide assortment of genres, including some Latin jazz and jazz-influenced material. From a jazz standpoint, the album's most noteworthy songs include Nascimento's "Cravo e Canela", "Love Reborn", and "Up from the Sea It Arose and Ate Rio in One Swift Bite". The track "Brazilian Sugar" was featured on the 2006 video game Dead or Alive Xtreme 2. Meanwhile, Nascimento's vocal on the ballad "Ao Que Vai Nascer" is an example of Brazilian pop at its most sensuous. The 1992 film Leap of Faith featured gospel songs and choir produced by George Duke and choir master Edwin Hawkins. Duke worked as musical director at numerous large-scale musical events, including the Nelson Mandela tribute concert at Wembley Stadium, London in 1988. In 1989, he temporarily replaced Marcus Miller as musical director of NBC's late-night music performance program Sunday Night during its first season. Duke was also a judge for the second annual Independent Music Awards to support independent artists' careers. Duke worked with Jill Scott on her third studio album, The Real Thing: Words and Sounds Vol. 3; guesting on the track, "Whenever You're Around". In the summer of 2011, he put together a trio with David Sanborn and Marcus Miller for a tour across the US of more than 20 sold out shows. Duke died August 5, 2013 in Los Angeles from chronic lymphocytic leukemia. He was 67 and was survived by his sons, Rashid and John. He was laid to rest at Forest Lawn Memorial Park (Hollywood Hills), following a memorial service. Attendees included notable friends Chaka Khan, Lynn Davis, Sheila E., Malcolm Jamal Warner, Stanley Clarke, Al Jarreau, his niece Dianne Reeves, Jeffrey Osborne, Stevie Wonder, Marcus Miller, and Doug E. Fresh. Duke's songs have been used by a wide variety of contemporary musicians in a wide array of genres. These include: "I Love You More", sampled by house music-act Daft Punk for their hit "Digital Love"; "Guilty", sampled by electronica music artist Mylo in his song "Guilty of Love" on Destroy Rock & Roll. "For Love", sampled by underground hip hop artist MF Doom on his track "I Hear Voices"; "Someday", sampled by hip hop artist/producer Kanye West for Common in "Break My Heart" on his "Finding Forever" album; "You and Me", sampled and used by soul/rhythm and blues influenced hip hop-producer 9th Wonder on the track "Spirit Of '94" on the album Spirit Of '94: Version 9.0 which he made with Kaze; and "Reach for It", sampled by Ice Cube in "True to the Game" on his Death Certificate album and Spice 1 in "In My Neighborhood" on his self-titled debut album, and sampled by W.C. & The Maad Circle (featuring Mack 10 & Ice Cube) in "West Up" on their "Curb Servin'" album. Madlib utilized Duke's "My Soul" on the track "Mingus" from his "Madlib Medicine Show #8: Advanced Jazz" album. Duke was nominated for a Grammy as Best Contemporary Jazz Performance for After Hours in 1999. By popular vote, Duke was inducted into The SoulMusic Hall Of Fame at SoulMusic.com in December 2012. On August 5, 2014, exactly one year after Duke’s death, Al Jarreau, Duke’s long-time friend, released an album titled, “My Old Friend: Celebrating George Duke”, as a tribute to his music. The album featured 10 songs, all written by Duke. Jarreau enlisted Gerald Albright, Stanley Clarke, Dr. John, Lalah Hathaway, Boney James, Marcus Miller, Jeffrey Osborne, Kelly Price, Duke's niece Dianne Reeves, Patrice Rushen and many others to help create this tribute to Duke’s music. The album was released on Concord Records and it garnered the 2015 NAACP Image Award for Outstanding Jazz Album. Muir Woods Suite 5 1993 Warner Bros.
Is Love Enough 1997 Warner Bros.
After Hours 1998 Warner Bros.
1 Rereleased as "The Primal" by MPS in 1978. 2 Rereleased as "Pacific Jazz" by United Artists in 1978 albeit with a different track listing. 3 Solus was recorded in April 1971 and intended to be released as a single album by SABA but when SABA folded and became MPS the powers that be decided to postpone its release. They finally put it out as a double album in 1976 together with George's MPS debut "The Inner Source". The latter was recorded in October 1971. 4 Recorded in 1976 and released in 1978 (Europe-only). Released in the USA (in a slightly different version) as "The 1976 Solo Keyboard Album" by Epic/CBS in 1982. 5 Recorded in 1993 at the Montreaux jazz festival but the release got postponed until 1996. 1 2 3 Artist Biography by Thom Jurek (1946-01-12). "George Duke | Biography". AllMusic. Retrieved 2013-08-06. 1 2 3 "George Duke biography". George Duke Online. Retrieved January 30, 2016. 1 2 3 Watson, Ben, Frank Zappa: The Negative Dialectics of Poodle Play, St Martin's Press, New York, 1993, p. 294. ↑ "Independent Music Awards". Independent Music Awards. Archived from the original on July 13, 2011. Retrieved 2013-08-06. ↑ "Jazz keyboardist George Duke dies at 67 - MSN Music News". Music.msn.com. Retrieved 2013-08-06. ↑ "George Duke". answers.com. Retrieved 6 August 2013. ↑ "SoulMusic.com". SoulMusic.com. Retrieved 2013-02-04. ↑ Mitchell, Gail (August 5, 2014). "Al Jarreau Salutes George Duke on New Star-Packed Album". Billboard. Billboard. Retrieved January 30, 2016. 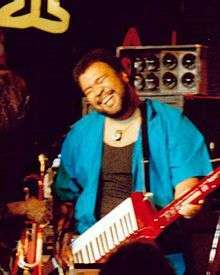 Wikimedia Commons has media related to George Duke. George Duke interview at allaboutjazz.com "New album, more treats". George Duke interview at allaboutjazz.com "Deja Vu". George Duke 2012 Interview Part 1 at Soulinterviews.com. George Duke 2012 Interview Part 2 at Soulinterviews.com.